As the category of women’s spirituality continues to grow, The Buddha’s Wife offers to a broad audience for the first time the intimate and profound story of Princess Yasodhara, the wife Buddha left behind, and her alternative journey to spiritual enlightenment. 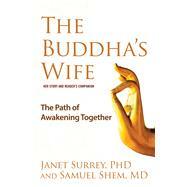 What do we know of the wife and child the Buddha abandoned when he went off to seek his enlightenment? The Buddha’s Wife brings this rarely told story to the forefront, offering a nuanced portrait of this compelling and compassionate figure while also examining the practical applications her teachings have on our modern lives. Princess Yasodhara’s journey is one full of loss, grief, and suffering. But through it, she discovered her own enlightenment within the deep bonds of community and “ordinary” relationships. While traditional Buddhism emphasizes solitary meditation, Yasodhara’s experience speaks of “The Path of Right Relation,” of achieving awareness not alone but together with others. The Buddha’s Wife is comprised of two parts: the first part is a historical narrative of Yasodhara’s fascinating story, and the second part is a “how-to” reader’s companion filled with life lessons, practices, and reflections for the modern seeker. Her story provides a relational path, one which speaks directly to our everyday lives and offers a doorway to profound spiritual maturation, awakening, and wisdom beyond the solitary, heroic journey.